The Mimosa C5c is a flexible connectorized client radio solution for accommodating long range and custom antenna solutions. Incorporating unique Multi-User MIMO technology and TDMA client technology for the Mimosa GPS sync enabled network, the C5c enables the fastest speeds and is the most scalable wireless access solution available today. The C5c is ideal for professionally installed rural fixed wireless and long range applications. The Mimosa G2 Gateway is an elegant and compact Wi-Fi Gateway that simplifies in-home managed broadband delivery. 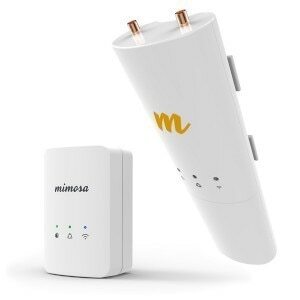 Designed to easily install directly into a wall plug, the Mimosa G2 also provides integrated Power over Ethernet for powering Mimosa C5 client premise devices. Offering superior indoor Wi-Fi range, the cloud-managed Mimosa G2 is designed to extend the managed broadband infrastructure all the way to the subscriber’s mobile and fixed Wi-Fi devices.